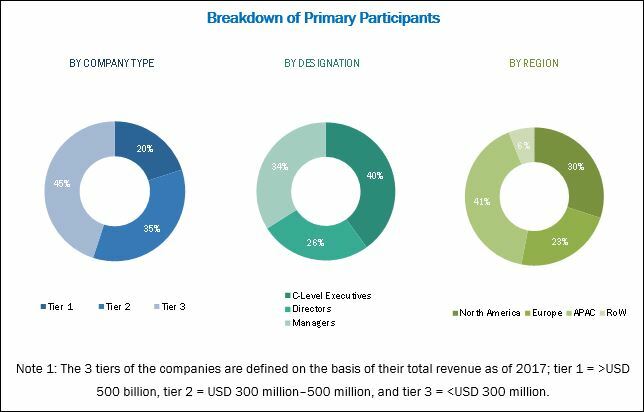 [193 Pages Report] The video surveillance market was valued at USD 36.89 Billion in 2018 and is expected to reach USD 68.34 Billion by 2023, at a CAGR of 13.1% during the forecast period. The base year considered for the study is 2017, and the forecast period considered is between 2018 and 2023. The objective of the report is to provide a detailed analysis of the video surveillance market based on system, offering, vertical, and regions. The report forecasts the market size, in terms of value, for various segments with regard to 4 main regions—North America, Europe, APAC, and RoW. It strategically profiles the key players and comprehensively analyzes their rankings and core competencies in the video surveillance market, along with detailing the competitive landscape for these market leaders. The research methodology used to estimate and forecast the video surveillance market begins with capturing data on key vendor revenues through secondary research. Secondary sources used for this research study include government sources and corporate filings (such as annual reports, investor presentations, and financial statements). The bottom-up procedure has been employed to arrive at the overall size of the video surveillance market from the revenue of key players in the market. After arriving at the overall market size, the total market has been split into several segments and subsegments, which have been verified through primary research by conducting extensive interviews with experts such as CEOs, VPs, directors, and executives. The data triangulation and market breakdown procedures have been employed to complete the overall market engineering process and arrive at the exact statistics for all segments and subsegments. The breakdown of the profiles of primary respondents has been depicted in the below figure. 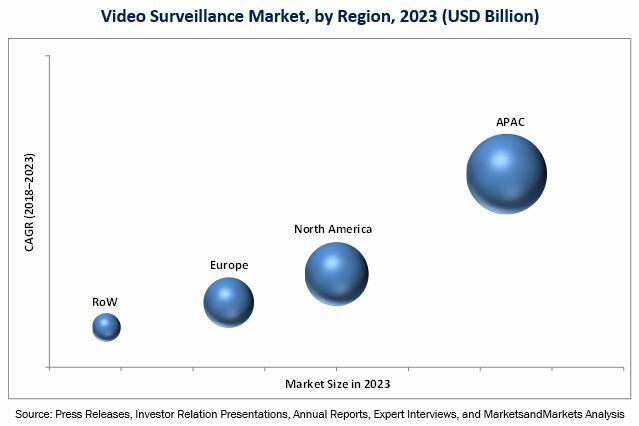 The video surveillance market comprises a network of players involved in research and product development, raw material suppliers, manufacturers, investors, and distributors. Players operating in the video surveillance market include Hikvision (China), Dahua (China), Axis Communications (Sweden), Bosch Security Systems (Germany), FLIR (US), Avigilon (Canada), Hanwha Techwin (South Korea), Honeywell Security Group (US), Infinova (US), Pelco (US), BCD Video (US), CP Plus (India), Nice Systems (Israel), Panasonic (Japan), Tiandy (China), Uniview (China), Vivotek (Taiwan), and Zicom (India). This report categorizes the video surveillance market on the basis of systems, offerings, verticals, and regions. The video surveillance market is estimated to grow from USD 36.89 Billion in 2018 to USD 68.34 Billion by 2023, growing at a CAGR of 13.1% between 2018 and 2023. The growth of this market can be attributed to the increasing concerns for public safety and security, rising adoption of IP cameras, and growing demand for DIY and spy cameras. This report segments the video surveillance market on the basis of system, offering, vertical, and region. The video surveillance market based on systems has been segmented into analog video surveillance systems and IP video surveillance systems. The market for IP video surveillance systems is expected to grow at a higher CAGR between 2018 and 2023. The market for IP video surveillance systems is expected to grow at a rapid pace in the near future owing to the technological advancements in IP cameras and advantages offered by IP cameras such as superior image quality, scalability, and flexibility, and reliability. The video surveillance market based on verticals has been segmented into commercial, infrastructure, military and defense, residential, public facility, and industrial. The market for the commercial vertical is expected to grow at the highest CAGR during the forecast period. The growth of this vertical is attributed to the increasing use of video surveillance systems in applications such as retail stores and malls, enterprise and data centers, banking and financial buildings, hospitality centers, and warehouses. Retail stores and malls are likely to be the fastest-growing applications in the video surveillance market. Retail shops and malls are more prone to security risks, such as theft, accidental loss, product diversion, vandalism, and inventory loss, compared to other business properties. APAC is expected to grow at the highest CAGR in the video surveillance market during the forecast period. The use of security cameras is expected to increase in APAC countries as these are emerging economies with a growing number of manufacturing bases, and the terrorist attack is a strong possibility. Moreover, the market for video surveillance is expected to witness an upsurge in APAC owing to the increased security concerns in APAC countries such as India and China. The requirement of high-capacity storage systems and higher bandwidth is one of the major challenges faced by the video surveillance system providers. Also, due to the cybersecurity threats, it poses a big challenge to use cloud-based services; there can be cybersecurity threats for the data that is uploaded to the cloud platform. Major players in the video surveillance market are Hikvision (China), Dahua (China), Axis Communications (Sweden), Bosch Security Systems (Germany), FLIR (US), Avigilon (Canada), Hanwha Techwin (South Korea), Honeywell Security Group (US), Infinova (US), Pelco (US), BCD Video (US), CP Plus (India), Nice Systems (Israel), Panasonic (Japan), Tiandy (China), Uniview (China), Vivotek (Taiwan), and Zicom (India).